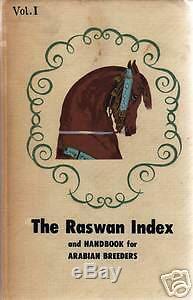 The Raswan Index and Handbook for Arabian Breeders Vol. ISBN: none Publication date: 1957 Format: Hardcover Size: 5 1/2 x 8 1/4 inches Pages: 177 plus separately numbered plates and inserts Condition: Good+. Light soil to the cover, spine is age-darkened. Light moisture stain on back, no rippling or mildew. Very light soil to front pastedown and page edges. Page III (photo of Ibn Hamad) has 3 closed tear in upper corner, does not affect Ibn Hamad but slightly affects figure of Blunt Arabian on reverse. Number 357 of 380 copies, numbered and signed by Raswan. This is a very nice and extremely scarce copy of the first edition of Vol. I of The Raswan Index. This copy is bound in the original cover. The Raswan Index is a compilation of information on Arabian horses, Arabic terms and names, and other information put together by Carl Raswan in seven volumes over a period of several years. Raswan spent thirty years in the Middle East, off and on, living with and learning about the Bedouins and their horses. His Index is a vast distillation and summary of the knowledge he acquired during a lifetime of studying Arabian horses. This book covers not only Middle Eastern horses, but also those imported to other parts of the world, particularly England, the United States, and Poland. The main portion of each book is an alphabetic listing of this information. In this volume, plates and photos are interspersed with the text as well as being grouped in two sections toward the end of the book. They include many photos of Blunt and Davenport Arabians and many others of pure Ali Pasha Sharif blood. There is a very nice photo of Measoud among others. The Raswan Index is a key element in the tracing of Arabian bloodlines. Since the Bedouins kept only oral records of the bloodlines, Raswan's work was the first time much of this information became widely available. In addition, Raswan studied the bloodlines carefully and provides a great deal of information about their effect on conformation, particularly when he compares photos of different horses. Raswan mailed out each unbound installment as he finished writing and printing it, and he also provided covers in which to bind the collected installments. Only 380 copies of this book were printed, after which the plates were destroyed. There have been subsequent editions of this book, some of them abridged, but copies of the first edition are extremely scarce. This book would a valuable addition to any collection. Please do not copy my photos or descriptions. I 1ST EDITiON Arabian horse book" is in sale since Thursday, December 25, 2008. This item is in the category "Books\Antiquarian & Collectible". The seller is "horsetalesbooks" and is located in Chimacum, Washington. This item can be shipped worldwide.